UK aerospace firms have said they are being excluded from bidding for space contracts because of the Brexit vote. 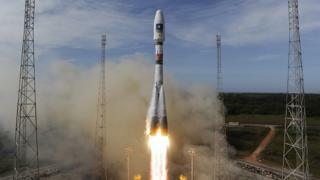 Contracts for the European navigation satellite system, Galileo, were being particularly affected, Simon Henley of the Royal Aeronautical Society said. Aircraft manufacturer Airbus warned that other countries were "knocking at the door" to take business from the UK amid the uncertainty caused by Brexit. Both comments were made to MPs on the Business Committee . The head of the ADS aerospace trade body also warned MPs that if the UK was to leave the EU without a deal, it would be "chaotic" for the industry. ADS chief executive Paul Everitt said: "No deal would be the worst possible outcome, from an industry point of view. We believe that would be chaotic, and unhelpful for this particular sector, and a number of others." Mr Henley said UK companies had reported they were being excluded from bidding for contracts. "Although membership of the European Space Agency is not part of the EU discussions because it is not an EU body, many of the contracts, including Galileo, are EU funded. "And it's a requirement that the companies that participate and get funding for their contracts are part of an EU country, so we are already seeing contracts being turned away from UK industry," he said. Katherine Bennett, senior vice president of Airbus UK, which builds wings at Broughton in North Wales warned that the impact of Brexit meant future investment could go outside the UK. "Other countries would dearly love to design and build [Airbus] wings and some already do - we actually build wings in China, and believe you me they are knocking at the door as a result of the situation we find ourselves in in this country," she said. A spokeswoman for the Department for Business, Energy and Industrial Strategy, said: "We have been clear that, given the unique nature of space programmes, the EU and UK will discuss all options for future cooperation in the negotiations." People within the aerospace industry are clearly getting nervous - largely due to uncertainty around the form Brexit will take, and the nature of any transitional arrangements. In the current febrile political environment, it's hard to see Paul Everitt's call for Britain to remain in the EU during a transitional period gaining much traction. But as he explained to MPs, he was laying down a marker. His point was that aviation and aerospace relies on a complicated network of bilateral deals with third countries, not to mention a predictable regulatory and certification regime. Currently aerospace businesses don't know what will happen when we leave the EU - and a no deal scenario, he suggested, would be pretty disastrous. That wasn't the only warning, of course - Simon Henley raised eyebrows with his suggestion that uncertainty was already costing UK space businesses the chance to bid for potentially lucrative contracts. And while Airbus UK's Katharine Bennett was quite measured - the company was big enough, she suggested, to absorb higher costs - she too fired a telling shot. Her allusion to other countries "knocking on the door" to build the wings currently made in Broughton was gently made, but it carried a firm message. Airbus wants to carry on manufacturing in the UK - but future investment could easily go elsewhere. The space industry is worth about £14bn to the UK, with about 40,000 direct employees, according to the Aerospace, Defence, Security & Space (ADS) industry group. ADS chief Mr Everitt told MPs there had been particularly fast growth in the sector thanks to growth in the market for satellites, which was due to projects such as Galileo. In the wider aerospace industry, Mr Everitt said Brexit uncertainty was having an effect on investment. "We are not faced with huge new investment decisions. We've seen some good and positive decisions for the UK, but they were taken prior to the referendum. "At the moment, and excuse the pun, everyone's in a bit of a holding pattern, because they are trying to sweat their assets for as long as possible before they commit to new investment."